Would you like to learn about real estate investing in a manner that allows you to gain real underlying knowledge while encouraging you to take action? 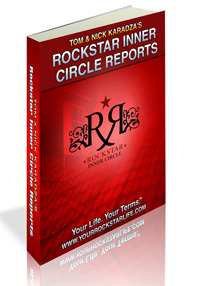 Then you may be interested in the Rock Star Reports - one of our most popular real estate investing products. Real Estate Investing Products Can Give You the Push You Need! They are a series of 52-weekly "bite-sized" reports that walk you through real estate investing step-by-step. The information is intentionally released to you in steps so that you have time to digest and take action on each step. If you are a beginner or experienced investor looking to supplement your learning or searching for that "razor's edge" to enhance your existing portfolio of properties this will interest you. "I've found the Karadza brothers and their team very responsive to any questions I've had. They love what they do and their enthusiasm is genuine and infectious. They have a product offering that is far more affordable than some of the other investment education programs, leaving one with some cash left to apply what was learned. They also have a strong support system in place that one can use to keep the momentum going." Return from Real Estate Investing Products to the Canadian Real Estate Investing Guide by clicking here.